By the mid-Victorian period, however, the beard came back into fashion with remarkable swiftness. Part of the reason for this was changing ideals of masculinity. This was the age of exploration, of hunters, climbers and explorers. 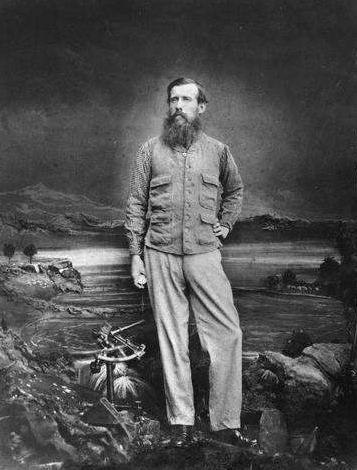 As rugged adventurers began to tackle the terra incognita of far-flung continents, they would immerse themselves in wild nature, letting their beards grow thick. The beard became a symbol of rugged manliness and men began to emulate their bewhiskered heroes. Another element of the rise of the beard, however, was the supposed medical benefit of facial hair. In the sixteenth and seventeenth centuries, facial hair had been viewed as a form of bodily waste. 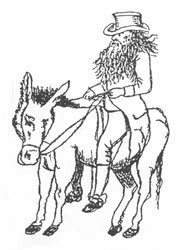 It was regarded as resulting from heat in the liver and reins, and was partly a signifier of a man’s virility. Equally though, as a waste product, shaving it off might be seen as healthy as it was another way of ridding the body of something potentially harmful. By 1850, however, doctors were beginning to encourage men to wear beards as a means of warding off illness. As Oldstone-Moore points out, the Victorian obsession with air quality saw the beard promoted as a sort of filter. A thick beard, it was reasoned, would capture the impurities before they could get inside the body. Others saw it as a means of relaxing the throat, especially for those whose work involved public speaking. Some doctors were even recommending that men grew beards to avoid sore throats. Clergymen who shaved, according to one correspondent in the Hampshire Advertiser in 1861, invited all sorts of ‘thoracic and pectoral woes’! The 1894 edition of the Gloucestershire Notes and Queries contains an interesting example of this practice, but actually goes further by claiming that the county of Gloucestershire was in fact the first in Britain to fully embrace the beard! In a letter headed up ‘The Moustache and Beard in Gloucestershire’ the journal reported that ‘the custom among the civil population of wearing moustaches was first started in Gloucestershire’. I took his advice, and have not had a sore throat since, and it was the opinion of many of my friends and acquaintances in Gloucester that the moustache and beard was a great improvement to my looks and added immensely to the dignity of my countenance, so much so that a great many of them began to cultivate the beard and moustache, and amongst them a very prominent druggist (Mr Tucker) and woolen draper (Mr F.C.Newman) and within a very few years beards and moustaches were cultivated by hundreds in Gloucester and neighbourhood, and are now almost universal’. Thanks to Prof. Jonathan Barry for passing this example to me. You heard it here first though; Gloucestershire was the beard progenitor of Victorian Britain. Whatever the truth of the matter, the medical aspect of beards and facial hair is one that invites more study. Were there any quack medicines, for example, that used the supposed medical benefits of beards as a selling point. 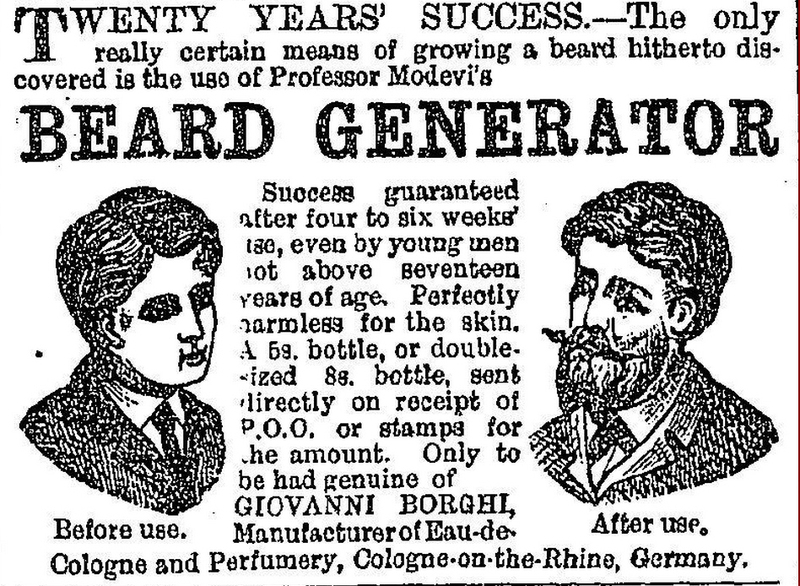 I’ve only found one so far – the so-called ‘beard generator’, and this was more an aid for beardless boys who were lacking in the chin-whisker department. Yet another reason to continue research into this fascinating, and often overlooked, aspect of the history of masculinity and the body. I love the way this ties medicine, countenance and dignity. The Beard Generator! I love it. Sounds like something that would grow beards in a petri dish, rather than in a gentleman’s face. A fascinating historical twist! As one who has had a full beard and last shaved over 40 years ago and is also a proponent of natural medicine, it is good to have a further justification! 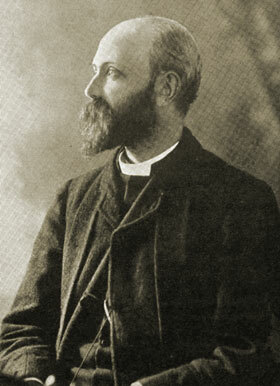 The two of my great grandfathers that I have photos of both have impressive beards, and one of them was a clergyman. Hi, I recently wrote a blog post where I tried to show factual benefits for growing a beard and argue that supposedly “bad” medical advice was not out of place. Would love to hear your opinion? The most fascinating benefit I found was about a study in Australia that mentioned how beards blocked UV Rays. Hi – thanks very much for your comment, and I really enjoyed your post. I think the whole beards/health debate often says more about contemporary attitudes to facial hair than concrete health issues, with each side trying to use science to back up its own claims! I’m going to side with Darwin and suggest that, as the beard is natural, it can’t possibly be unhealthy…can it??! Pingback: IMAO » Blog Archive » Link of the Day: Why I Will Outlive Frank J.